Wow, I can’t believe January is almost over! It seems like just yesterday I was home for the holidays enduring snowstorm after snowstorm and now we’re almost entering my least favourite month. Anyhoo, today I’m going to share another salad dressing recipe because it is my belief that all foods exist as vehicles for delicious sauces and fats. Yes steak is delicious, but how much more delicious is a juicy grassfed sirloin when it’s covered in organic garlic butter sauce?! That’s right. It doesn’t even compare! So today I’m going to share one of my favourite dressing recipes. I often eat it with a spoon, as I’m wont to do and actually had it as a light snack last night before yoga to give me some energy without filling me up. Today is day 17 of 40 and I must say I’m feeling pretty fab! Noticing lots of new muscles, much less stiffness and achiness, and a calmness that wasn’t there before. I’ll do up another post specifically on my journey in the next couple of days, but so far it’s been stellar. Now, without further ado, here is our all-star cast! These veggies are chock full of phytonutrients (plant nutrients) which help decrease inflammation in the body. Since inflammation can be the root cause of a host of chronic illnesses, ensuring that the food we eat promotes anti-inflammatory actions in the body will help keep us healthy and happy for years to come. Like garlic and cauliflower (two of my all-time favourite foods!!! ), they also contain sulfur compounds, which are excellent for our bodies’ detox pathways! One of the best ways to get and stay healthy is to ensure that your liver is functioning at an optimal level and onions are a great way to help support this sweet organ. The grapefruits I like to use for my dressings are bright pink, because I like my food to be pretty as well as tasty. Fortunately, this pink colour is created by lycopene, a carotenoid phytonutrient that protects us from free radical damage. Free radicals that are found in the body are atoms, molecules, or ions with unpaired electrons. Since these electrons are lonely and searching for “the one” they roam around your body either looking to steal an electron or lose an electron, which makes them very volatile. As they’re darting around willy nilly, looking for a mate, their volatility enables them to change the form or function of cells in your body. Enter Super Antioxidants, who ever so nobly donate an electron to the free radical, making him happy and whole in his new relationship, without becoming as damaging as the free radical to which it has donated its electron. This citrus fruit is great for supporting liver detoxification; contains unique flavonoid phytonutrients, such as hesperitin & naringenin, which have super potent antioxidant properties; and it’s a pretty wicked source of vitamin C.
When buying olive oil, you want to look for Extra Virgin on the label. Olive oil that is labeled as such comes from the first press of the olives and contains the highest amount of phytonutrients (especially polyphenols) that have been shown to have anti-inflammatory effects in the body. Inflammation is one possible root cause for a myriad of bodily imbalances, so we want to eat as many foods that promote a healthy inflammatory response as possible. Olive oil is made up of about 70% oleic acid, which has been shown to help lower blood pressure. Plus, fat is delicious and we should never deprive ourselves of healthy fat sources! Especially because certain fat-soluble vitamins, such as A, D, E, & K are only absorbable in the presence of fat. When bought in the unpasteurized form with the mother it can help improve digestion and ensure regular bowel movements, which is necessary for proper detoxification and elimination. If you have a hard time digesting certain foods or suffer from heartburn, you can try taking a Tbsp. about 15-20 minutes before meals (in water if you don’t want the burn) to see if it helps. Oftentimes heartburn is a sign of low stomach acidity, as the food you eat begins fermenting in the stomach since the proper pH is never reached allowing it to be passed along to the small intestines. It makes a great skin toner! Just add 1 part ACV to 10 parts water and use before bed. Certain studies have shown that consuming ACV with a meal can help balance blood sugar, which is key to managing energy and inflammation throughout the body. Thanks to its sulfur content, specifically in the form of allicin, garlic has great anti-bacterial and antiviral properties and helps boost antioxidant activity. These same sulfur compounds also help regulate inflammation in the body by inhibiting specific enzymes, lipoxygenase & cyclooxygenase, that generate inflammatory prostaglandins. Phew! What a great list of ingredients, now let’s get to the good stuff! 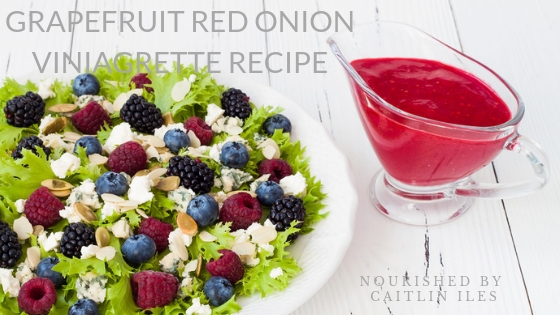 This recipe is a great combination of sour and sweet that helps support the liver and adds tons of brightness to any salad! Combine all ingredients except olive oil in a large bowl or food processor. Blend together (I use an immersion blender). Once first 7 ingredients are combined, slowly add oil while continuing to blend. Add a pinch of salt to taste. Allow to sit overnight in the fridge for best flavour. Store in the fridge for 7-10 days. Well there you have it folks! A quick and easy, super tasty, and uber nutritious salad dressing you can use to flavour pretty much anything in your kitchen.